Item shown above : Mahogany Finish (Side Profile) with Black color Felt background. (Flag, Certificate, Badges, Medals, Pins, Emblems are not included). NOT for Funeral or Burial Flag. If you need it for such, please see flag display cases for size 5'X 9.5' Flag. 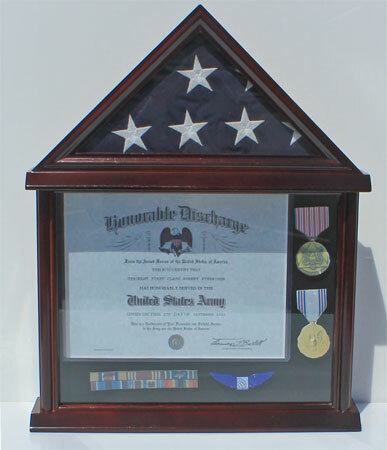 All-in-one Flag and Memorabilia display case holds the standard 3' x 5' service flag with attached display case to proudly display all your treasured awards and memorabilia. The display case has a glass front. Easy access from the back. You can put it on a table or hang it on the wall. Velcro-friendly backing for easy mounting of memorabilia. Foam under the backing felt for pins to push in. The bottom box measures 11"H X 12.4"W. No assembly required. This item is similar to FC11 only with more height for the shadow box portion. So, you can display a certificate Vertical or Horizontally and still have space for Insignia. Interior:: Flag Display area: 13"W X 6.5"H. Base to top, sides: 9". Interior of shadow box is 11.1"H X 12.4"W.